The genesis of closed-circuit televisions was a revolution in the world of security. Despite the many startling advances in communications technology that have occurred since then, many organizations still rely on solutions not radically different than the first CCTV systems. The fundamental unit of video surveillance technology is still a simple standalone camera that offers 24/7 recording of a workspace. However, advances in image processing and recognition allow these cameras to do much more than ever before. These new technologies drastically alter the capabilities of today’s video surveillance systems. New security advancements allow these devices to play a critical role in a variety of fields throughout the modern business ecosystem. • Facial Recognition. Facial recognition technology allows cameras to identify known individuals and send personalized updates to users. This includes the ability to identify strangers, follow their movements, and generate updates to report their behavior or trigger an alert. • Smartphone Integration. The modern business security center is the smartphone. Video surveillance software can now stream directly to users’ mobile devices. The actual camera footage is safely stored off-site in a cloud-based database, ensuring practically unlimited access to high-definition footage. • 360-Degree Field of View. Outdoor security cameras can now see in all directions. Video surveillance technology offers solutions that consolidate multi-camera setups with a single 360-degree view that offers comprehensive coverage with a single device. • Two-Way Communication. Security cameras that offer two-way communication improve monitoring and security processes. They allow subjects to speak directly to security personnel, which is useful for access control purposes. Some cameras even incorporate voice control solutions for the device itself. • Improved Employee Productivity. Employees tend to work more diligently when they know their supervisors are watching. But video surveillance can be a useful asset for employees as well – two-way communication can help different departments communicate easily. • Conflict Resolution. Finding the root source of a conflict can be instrumental in resolving it. High-resolution video surveillance and audio recording can ensure that supervisors know exactly what happened, who was involved, and why. This makes choosing the appropriate conflict resolution response far easier. • Improved Customer Experience. Cameras can do more than protect against theft. In a retail environment, they can track customer movements and deliver analytic reports about the attractiveness and success of certain stands, promotions, and products. This gives businesses data they can use to impact customer decisions. • Better Safety Compliance. Video surveillance is crucial in general industry, where supervisors take OSHA compliance very seriously. Video surveillance software can recognize safety violations and alert supervisors to infractions automatically, while two-way communication ensures that unsafe behavior is immediately addressed. • Legal Evidence. Even the best video surveillance technology can’t prevent all crimes. But high-resolution video with facial recognition analytics can be an enormous help during an investigation. Verify employee alibis and validate access control with reliable video evidence that can display even tiny details at a distance. Cost-savings remain the most convincing argument for implementing video surveillance in the modern business. Reducing theft and improving employee performance increases revenues and leads to better bottom line performance overall. 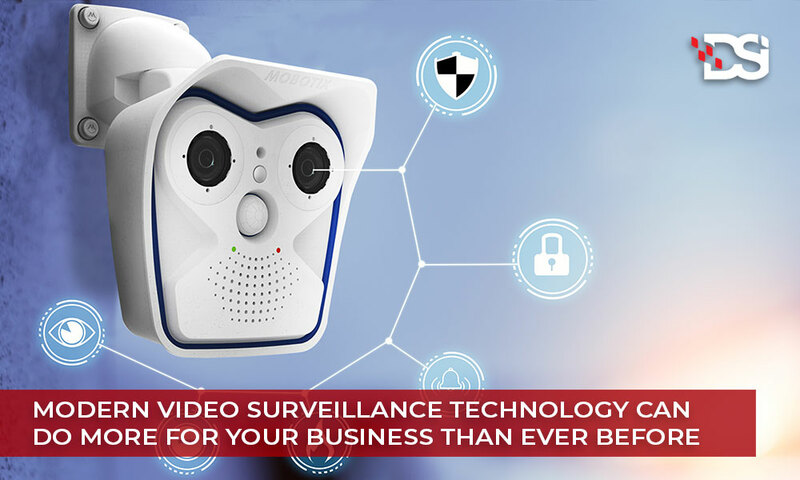 The most compelling security advancements in video surveillance technology are those that save time and money for business owners. Cloud technology makes it easy to record and archive a potentially unlimited amount of security footage without having to spend time and money maintaining your own database and backup solution. The combined ability to deter crime, improve the customer experience, and increase productivity in the workplace makes modern video surveillance a powerful value-generating asset. Organizations that have to follow strict regulations can benefit even more from the advanced features like facial recognition and two-way communication. Acquiring, deploying, and maintaining a video surveillance system requires expertise and formidable technical resources. Entrust your security integration system to a team of professionals that have experience solving difficult challenges for corporate, industrial, and institutional organizations. With the right IT infrastructure and hardware, your organization can significantly improve its security footprint without having to spend more than it saves. Leverage your investment in the best indoor and outdoor security cameras with a cloud-based integration system you can rely on. Invest in video surveillance technology and give your organization the security infrastructure it needs to prevent loss, improve accountability, and boost revenues. Talk to an expert at DSI New Mexico to find out how! Which is an apt description of the value that has driven our company to success for more than 20 years. From our humble beginnings as one of the first authorized remanufacturing companies in New Mexico to our current position as one of the most reputable office technology providers in the region, our focus has remained on developing innovative solutions for our customers.